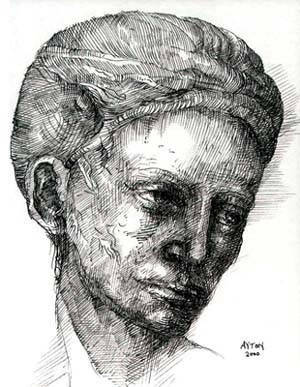 "Man's Head" 2000, pen & ink on paper, 12" x 9". A small drawing of a man's head that appeared more or less automatically. The 2001 "Head of a Man" is a variation on this image. Notes: "Collateral" and "Manowar" can also be seen on the War Room site. Clicking on the thumbnail images below will open larger versions of the works. This gallery focuses on drawings done after the year 2000. These are smaller works than the monochromes gallery pieces -- mostly carried out in ink on paper.